Arches National Park is a US National Park in eastern Utah. 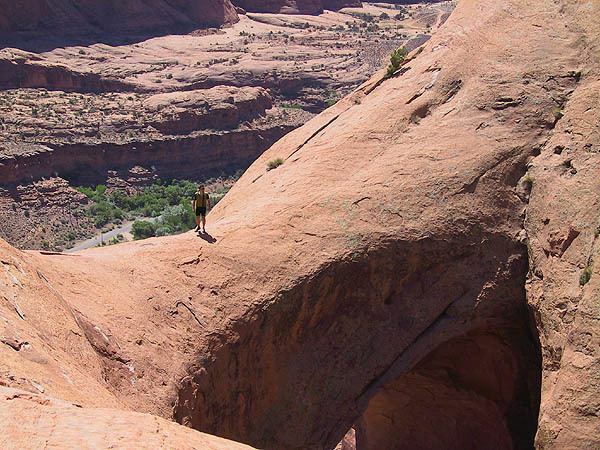 The park is adjacent to the Colorado River, 4 miles (6 km) north of Moab, Utah. It is home to over 2,000 natural sandstone arches, including the world-famous Delicate Arch, in addition to a variety of unique geological resources and formations. It contains the highest density of natural arches in the world. The national park lies atop an underground evaporite layer or salt bed, which is the main cause of the formation of the arches, spires, balanced rocks, sandstone fins, and eroded monoliths in the area. This salt bed is thousands of feet thick in places, and was deposited in the Paradox Basin of the Colorado Plateau some 300 million years ago when a sea flowed into the region and eventually evaporated. Over millions of years, the salt bed was covered with debris eroded from the Uncompahgre Uplift to the northeast. During the Early Jurassic (about 210 Ma) desert conditions prevailed in the region and the vast Navajo Sandstone was deposited. An additional sequence of stream laid and windblown sediments, the Entrada Sandstone (about 140 Ma), was deposited on top of the Navajo. Over 5,000 feet (1,500 m) of younger sediments were deposited and have been mostly eroded away. Remnants of the cover exist in the area including exposures of the Cretaceous Mancos Shale. The arches of the area are developed mostly within the Entrada formation. Although the park's terrain may appear rugged and durable, it is extremely fragile. More than 1 million visitors each year threaten the fragile high desert ecosystem. The problem lies within the soil's crust which is composed of cyanobacteria, algae, fungi, and lichens that grow in the dusty parts of the park. Factors that make Arches National Park sensitive to visitor damage include: semiarid region, and the scarce, unpredictable rainfall, lack of deep freezing, and lack of plant litter which results in soils that have both a low resistance to, and slow recovery from, compressional forces such as foot traffic. Methods of indicating effects on the soil are cytophobic soil crust index, measuring of water infiltration, and t-tests that are used to compare the values from the undisturbed and disturbed areas. The following year, additional support for the monument idea came from Laurence Gould, a University of Michigan graduate student (and future polar explorer) studying the geology of the nearby La Sal Mountains, who was shown the scenic area by local physician Dr. J. W. "Doc" Williams. A succession of government investigators examined the area, in part due to confusion as to the precise location. In the process, the name "Devil's Garden" was transposed to an area on the opposite side of Salt Valley, and Ringhoffer's original discovery was omitted, while another area nearby, known locally as "The Windows", was included. Designation of the area as a national monument was supported by the Park Service from 1926, but was resisted by President Calvin Coolidge's Interior Secretary, Hubert Work. Finally in April 1929, shortly after his inauguration, President Herbert Hoover signed a presidential proclamation creating Arches National Monument, consisting of two comparatively small, disconnected sections. The purpose of the reservation under the 1906 Antiquities Act was to protect the arches, spires, balanced rocks, and other sandstone formations for their scientific and educational value. The name "Arches" was suggested by Frank Pinkely, superintendent of the Park Service's southwestern national monuments, following a visit to the Windows section in 1925. Astronomy is also popular in the park due to its dark skies despite the increasing light pollution from towns like Moab. American writer Edward Abbey was a park ranger at Arches National Monument where he kept journals that became his book Desert Solitaire. The success of this book, as well as the rise in adventure-based recreation, has drawn many hikers, mountain-bikers, and off-road enthusiasts to the area, but activities are limited within park boundaries: camping, foot hiking (along designated trails), and driving only along marked roads. The Hayduke Trail, an 825-mile (1,328 km) backpacking route named after one of Edward Abbey's characters, begins in the park. Arches National Park was used as one of the filming locations for the 1965 biblical epic film, The Greatest Story Ever Told. Arches National Park is the subject of the third 2014 quarter scheduled as part of the U.S. Mint's America the Beautiful quarters coin program commemorating national parks and historic sites. There is an abundance of wildlife in Arches. The list includes: spadefoot toad, antelope squirrel, scrub jay, peregrine falcon, many kinds of sparrows, red fox, desert bighorn sheep, kangaroo rat, mule deer, cougar, midget faded rattlesnake, yucca moth, many types of cyanobacteria, Western rattlesnake, and the Western collared lizard. Plants also dominate the landscape in the park. The list of plants includes: prickly pear cactus, Indian ricegrass, bunch grasses, cheatgrass, lichen, moss, liverworts, Utah juniper, Mormon tea, blackbrush, cliffrose, four-winged saltbrush, pinyon pine, stemless woollybase, evening primrose, sand verbena, yucca, and sacred datura.